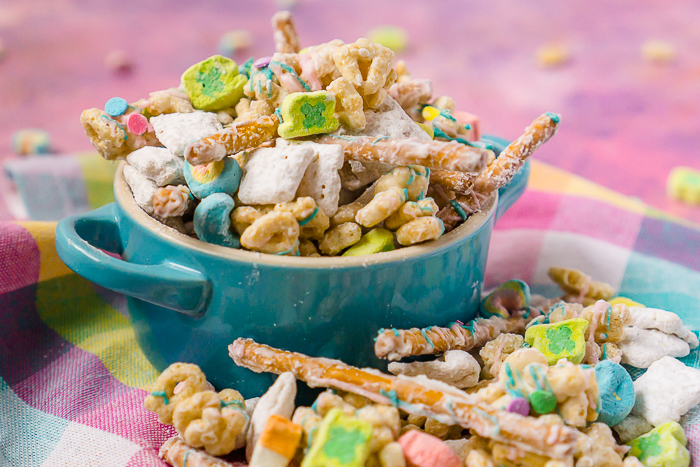 Lucky Charms Puppy Chow is a deliciously easy St Patrick’s Day dessert recipe for the whole family! Kids and adults will both love this sweet and salty treat! Kid Friendly Recipe for St. Patrick’s Day that You Won’t Be Able to Put Down! Over the last few years, I have become a big fan of puppy chow – or muddy buddies. Whatever you want to call them is good with me! With nut allergies in the family, I’ve been experimenting with different puppy chow recipes without peanut butter, like my Bunny Chow for Easter and this Lucky Charms Puppy Chow for St. Patrick’s Day. I love the sweet and salty combination of this recipe so much that I really don’t miss the peanut butter at all! The sweet comes from the Chex Mix cereal coated in chocolate and powdered sugar, a call back to traditional puppy chow recipes, as well as Lucky Charms Marshmallows and chocolate drizzle. The salty comes from the pretzel sticks. It’s the perfect pairing in my opinion. I love it so much that I’m pretty sure pretzels will be making an appearance in more of my puppy chow in the future. Time to Make this Easy St. Patrick’s Day Dessert Recipe! 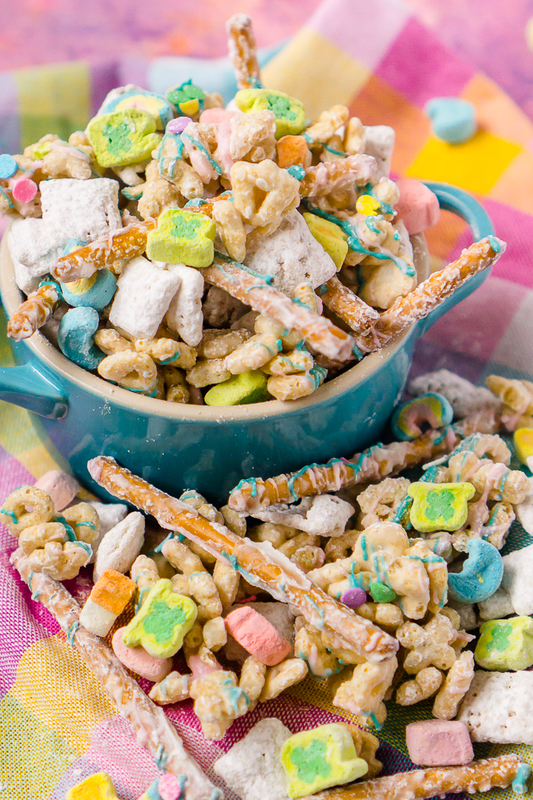 Lucky Charms Puppy Chow is a deliciously easy dessert recipe for the whole family! 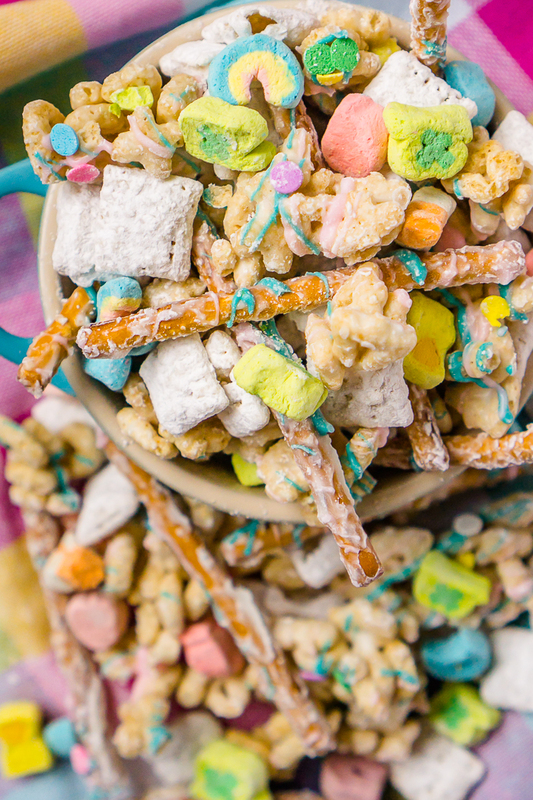 Lucky Charms, Rice Chex, Pretzels, Candy Melts, and Sprinkles combine to make this sweet and salty kid friendly recipe for St. Patrick's Day! In a medium microwavable bowl, microwave 6 ounces of white candy melts or white chocolate chips in 30 second intervals, stirring in between, until completely melted. Pour over Chex Mix and toss until evenly coated. Add powdered sugar and coated Chex Mix to a Ziploc bag. Seal and gently toss and shake until fully covered. Lay out on parchment paper to cool and set. Pour over pretzel sticks and Lucky Charms cereal and toss until evenly coated. They will not be covered as thoroughly as the Chex Mix and that's okay. Spread pretzel sticks and Lucky Charms cereal onto parchment paper to cool in a thin layer. Melt 3 ounces of two colored candy melts in microwave separately, following same instructions as before. Using a spoon, drizzle both colors over the Lucky Charms cereal and pretzel sticks. Add sprinkles while chocolate is still warm enough for them to stick. Once everything is cooled and chocolate is set, break apart and combine pretzel sticks, Chex Cereal, Lucky Charms cereal, and Lucky Charms marshmallows. Enjoy!